Thanksgiving Day Trot for Hunger - November 22, 2018, 8:30 a.m. Beginning at Freedom Plaza, between 13th Street, NW and 12th Street, NW, Washington, D.C. Sponsored by SOME (So Others Might Eat), this popular 5K fun run and family walk benefits programs for the homeless, and helps SOME to serve more than 800 meals to the hungry every day of the year. Cranberry Crawl 5K/10K Run and Race Walk - November 17, 2018, 7:50 a.m. East Potomac Park Golf Course, 972 Ohio Drive SW, Washington, D.C. (703) 481-3530. The annual turkey trot is sponsored by Potomac Valley Track Club. Turkey Chase Bethesda–Chevy Chase YMCA - November 22, 2018, 8:30 a.m. 9401 Old Georgetown Rd. Bethesda, Maryland (301) 440-1854. 10K Race and 2 mile Fun Run. Every Thanksgiving for the past 35 years, thousands of runners have gathered in Bethesda to run in the Turkey Chase in support of the YMCA's Youth and Family Services, YMCA Bethesda-Chevy Chase and the Bethesda-Chevy Chase Rotary Club Foundation. Turkey Trot 10K/ Turkey Trot Miler - November 17, 2018, 9:30 a.m. Marine Corps Base Quantico LeJeune Hall, Quantico, Virginia. Organized by the Marine Corps Marathon, participants will kick off their Thanksgiving Day celebration with a preemptive strike against those extra holiday calories by traversing Russell Road with scenic glimpses of Chopawamsic Creek, heading back east to pass by Butler Stadium and completing their 6.2 miles at Lejeune Hall. Alexandria Turkey Trot - November 22, 2018, 9 a.m. George Washington Middle School, 1005 Mt. Vernon Avenue, Alexandria, Virginia. DC Road Runners Club, a local group affiliated with USA Track & Field, sponsors an annual race on Thanksgiving Day. Food donations support ALIVE!, a nonprofit organization serving Alexandria's needy. Arlington Turkey Trot - 5K Fun Run/Walk - November 22, 2018, 8 a.m. Christ Church of Arlington, 3020 North Pershing Drive, Arlington, Virginia. The run goes through Lyon Park and Ashton Heights and raises money for three local Arlington charities: Arlington-Alexandria Coalition for the Homeless, Doorways for Women and Children and Arlington Food Assistance Center. Freeze Your Gizzard 5K Cross Country Race - November 17, 2018, 9 a.m. Ida Lee Recreation Center, 60 Ida Lee Dr., Leesburg, Virginia (703) 777-1368. Food donations will benefit Loudoun Interfaith Relief, the largest food pantry in Loudoun County and an organization providing support to homeless shelters, low-income senior citizen housing centers and after school programs for at-risk children. 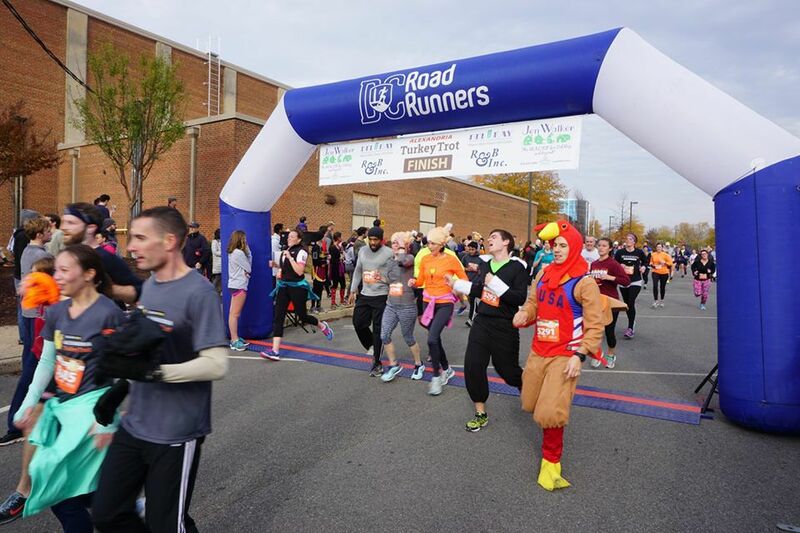 Virginia Run Turkey Trot - November 22, 2018, 8 a.m. Thanksgiving Day 5k Run/2k Walk. Virginia Run Community Center, 15355 Wetherburn Court, Centreville, Virginia. Proceeds benefit Life with Cancer, a non-profit organization that enhances the quality of life of those affected by cancer by providing education, information and support. Turkey Trot for Parkinson's 5k and Gobble Wobble - November 22, 2018, 9 a.m. South County High School, 8501 Silverbrook Rd., Lorton, VA. Proceeds from this TeamFox event benefits the Michael J. Fox Foundation for Parkinson's Research.